Bear makers all over the world have been talking about needle felting (also known as dry felting) lately. It is a simple and easy-to-learn process that takes a lump of wool and turns it into a piece of felt that can be used to make a multitude of projects. According to teacher and bear maker Kathy Hays, needle felting "is the matting of wool fibers with a specially shaped needle. A medium to coarse fiber is placed on a foam mat, then needles are poked into the wool. The needles have tiny barbs in the shaft so as the needle goes into the fiber, it drags the fiber into the other fiber. This 'tangles' the fiber to keep it firm." 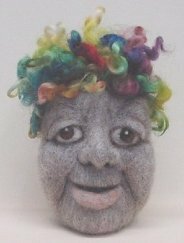 Kathy, who lives in Seminole, FL with her husband and two children, is a traditional felter but took up needle felting four years ago. "I use soap and water to create felt. Needle felting had been floating through the very small felting population, so I decided I wanted to know what the chatter was!" she said. Felting has been Kathy's primary focus. "During the past year and a half, I have really focused on making hand-made felt dolls and defining my own work. I create because I enjoy the act of creating," she commented. Fellow bear maker and needle felter Bobbie Ripperger, who hails from Illinois, has been needle felting for about as long as Kathy. "I've been a bear maker of miniatures under three inches since 1990. I bought my first needles three years ago but didn't do much with them due to lack of time for experimenting," she said. "August '02, some family health situations improved and gave me some breathing room, just as I discovered that after twelve years of intense, twenty-five-stitches-to-the-inch-sewing, arthritis was affecting my fingers too much to continue work as I'd known it. Not wanting to give up my minis, I picked up the needles in August and made my first 'something.' It wasn't turning out right, so I put it aside and made a rabbit based on one of my fabric patterns. I went right into realistic animals, especially polar bears." Compared with other crafts, Bobbie, who will be 61 in the Fall, said, "I think I've finally found my true art niche! "When designing a teddy bear or other soft-sculptured animal in fabric, all of the design thought process goes on before the scissors touch the fabric. The 'skin' is then cut, sewn and stuffed, like working from the outside inward. In needle felting, one starts from the inside - the basic shape or skeleton -- and builds up the muscles and final outer surface one bit of wool at a time. There is no pattern and it's almost impossible to get identical pieces. These are truly one-of-a-kind works," she continued. Needle felting is a relatively inexpensive craft to start. "The cost to begin needle felting is cheap. It takes a few needles -- an assortment is good -- ten dollars for a dozen. Small quantities of wool fiber, perhaps another ten dollars," Kathy said. "Needle felting is for beginners, it is simple and easy to learn." Bobbie recommends a foam cushion as well. "In the beginning (you should use) a foam cushion about twelve inches by fifteen inches by three inches, to keep from jabbing your hand, leg or tabletop with these very sharp points," she said. Bobbie thinks it is definitely something the family can do. "All of my grandchildren have sewn, knitted, crocheted and even tried tatting. Our fifteen-year-old grandson took one of my felted bases (the 'skeleton' inside) for a polar bear and turned it into a goose. Our eleven-year-old granddaughter tried it briefly but she lives twelve hundred miles away, so hopefully this summer she'll have a longer go at it." A six-inch Noggins created by Kathy Hays using needle felting. Students can create their own Noggins in her class for beginning needle felting at Crafty College. Kathy had a few tips for beginners. "Patience! For most people, learning to handle wool is the biggest hurdle. I come from a fiber background and know how to handle the carded wool, or roving. I have seen numerous students struggle with fiber. They want to treat it as a fabric, when in fact it is very flyaway. The other problem is that students want to work too fast and look for instant gratification after about ten minutes. To get a piece to look good, it takes time." Bobbie's tips: "Take your time. Practice, practice, practice. Use your imagination and let the wool become what it wants to be. If you start off making a teddy bear but it looks like a frog, go with frog!" Kathy began teaching needle felting online three years ago. "I am a fiber artist, doll artist, felt maker and bear maker," she said. "I teach online at Crafty College and really enjoy the venue. I do offer workshops locally and do travel outside my home state to teach doll making or felt making." Kathy feels that online classes in needle felting can be as good as in person. "I teach it online and in person. When good instructions are given, [along with] plenty of photos, you can easily learn." Bobbie has also designed a course for needle felting. "I've developed an online class for students to work at their own speed. The kits are bought and sent to the students, then I send the class lessons individually to them when they're ready. The kits are eighteen dollars and the class costs twenty-five dollars." For more information about the kits, classes or supplies, you can contact Bobbie by e-mail at RKR4CDS@attbi.com. You can also purchase needle felting starter kits and project kits from many online stores. 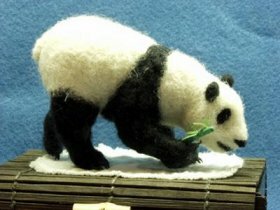 Needle felting is a craft that requires the use of a very sharp needle. This craft is not recommended for children under the age of 12. It is recommended that beginners wear band-aids on their fingers when first learning how to do this craft to minimize possible injury to their hands.